RTI Sends Letter to Stockholders Urging Them to Vote the White Proxy Card for its Highly Qualified Nominees - RTI Surgical Holdings, Inc.
ALACHUA, Fla. (May 12, 2016) – RTI Surgical Inc. (“RTI” or “the Company”) (Nasdaq: RTIX), a global surgical implant company, today sent a letter to its stockholders urging them to protect their investment in RTI by voting the WHITE proxy card FOR the election of Peter F. Gearen, Brian K. Hutchison, Thomas A. McEachin, Jonathon M. Singer, Paul G. Thomas, Nicholas J. Valeriani and Shirley A. Weis, RTI’s highly qualified director nominees, at the Company’s upcoming annual meeting of stockholders on May 26, 2016. Messrs. Gearen, Hutchison, and McEachin and Ms. Weis are existing directors. RTI has outlined and continues to execute against a clear value-creation strategy. RTI believes it can become a $500-million-revenue company by growing revenue faster than the market with gross margins approaching 60% and operating margins approaching 20% of total revenues. RTI believes that its financial results demonstrate that the strategy continues to gain traction. In 2015, revenues grew 7.4% (9% on a constant currency basis), adjusted EBITDA* grew 36.4% and adjusted net income* per fully diluted common share grew 109%. RTI is strategically shifting its focus to direct sales because it believes they have more growth potential, higher gross margins and greater predictability than commercial sales. RTI has successfully grown direct sales faster than the market and increased direct sales 11% year over year in the first quarter of 2016. As a result, RTI has been able to increase direct sales from approximately 40% of revenues in 2011 to approximately 50% of revenues in 2015, and expects to grow direct sales to approximately 60% of revenues in the long-term. RTI will continue to maintain its commercial business that sells through distributors. This business contributed 46% of total revenue in fiscal year 2015 and contributes cash flow that helps fund the expansion of RTI’s direct business. Additionally, these are long-term contracts and are extremely important to maximize the gift of donated tissue that is being entrusted to the Company. RTI has completed M&A that it believes has been transformational to better position the business for long-term growth. The successful acquisition and integration of Tutogen Medical in 2008 and Pioneer Surgical Technology in 2013 has broadened RTI’s portfolio, enabled the shift to a larger direct sales model, added faster-growing products, added new tissue applications to maximize the gift of donation, expanded tissue bank and organ procurement organization relationships, and contributed to stronger financial performance. RTI has consistently refreshed its Board in an effort to ensure it has the right leadership team to enhance long-term stockholder value. RTI’s independent nominating and governance committee conducted a thorough evaluation to identify director nominees and unanimously determined that RTI’s director nominees are the better leadership team to direct the Company’s next phase of growth and increase long-term stockholder value. RTI Surgical’s (“RTI” or “the Company”) annual meeting of stockholders is fast approaching. We urge you to vote FOR the election of RTI’s highly qualified nominees: Peter F. Gearen; Brian K. Hutchison; Thomas A. McEachin; Jonathon M. Singer; Paul G. Thomas; Nicholas J. Valeriani and Shirley A. Weis. Messrs. Gearen, Hutchison, and McEachin and Ms. Weis are existing directors. We believe our nominees have the right mix of qualifications, experience and skill sets to successfully direct RTI and oversee our strategy to create long-term value for ALL RTI stockholders. We have outlined and continue to execute against a strategic plan, which we believe is clear, to improve profitability and generate attractive returns. Important elements of our strategic plan include investing in our higher-gross margin direct sales business and broadening our implant portfolio to include metals and synthetics, while controlling our cost base. We believe that by executing this strategy we will become a $500-million-revenue company by growing revenue faster than the market with gross margins approaching 60% and operating margins approaching 20% of total revenues, and enhance long-term stockholder value. We believe that our fiscal year 2015 financial results demonstrate that our strategy continues to gain traction:* Additionally, our first quarter of 2016 exceeded our guidance on the top line and met guidance on the bottom line. We believe that you should vote for our slate of highly qualified nominees to ensure that we continue on this path of positioning RTI for long-term stockholder value creation. Drive growth in our focused products: map3® cellular allogeneic bone graft, nanOss® advanced bone graft substitute and U.S. direct surgical specialties. In the first quarter of 2016, revenue for this portfolio grew 48% year-over-year, with balanced growth across the three product groups. We expect our focused products revenue to grow at a five-year compound annual growth rate approaching 50% and generate gross margins of approximately 70%. Add strategically to direct distribution. We launched our first direct sales force in 2005 and expanded our direct sales steadily over the next 10 years. For our direct spine business, which is our largest direct business and represents 44% of our first quarter 2016 direct revenue, we have been adding representatives in a manner that we believe is strategic and targeted. This has driven in the first quarter of 2016 a year-over-year increase of 17% in revenues, 27% in our distributor relationships and 31% in surgeon users for our direct spine business. Innovate and launch new products. In 2015 we launched 16 new products or line extensions and so far in 2016, we have introduced three new spine products that we believe are important: the Unison-C Anterior Cervical Fixation System, which is a standalone device for interbody market; deformity instrumentation for the Streamline TL Spinal Fixation System, which is an expansion of our existing system that provides surgeons with the instruments necessary in challenging adult deformity cases; and the Release Laminoplasty Fixation System, which is a system that allows for central spinal cord decompression from C3 to T3 in laminoplasty procedures. We are also expecting the first human implantation of our long-term bovine project in mid-2016 pending ethical committee reviews. We believe this is an exciting product that could revolutionize treatment for ligament reconstruction, and we expect it to be the first product of this type for ligament reconstruction to have significant and relevant clinical data. Additionally, in the first quarter of 2016, the company signed an exclusive U.S. licensing agreement with Oxford Performance Materials for its 3-D printing technology platform and proprietary OXPEKK® polymer to manufacture spinal implants. Increase our international footprint. We have expanded our distribution to nearly 50 countries worldwide, and year-over-year we increased our international direct sales 18% in the first quarter of 2016. We installed a new international management team in the fourth quarter of 2015, we restructured our sales organization in Europe, the Middle East and Africa and are currently optimizing our sales teams in Asia Pacific and Latin America. As we pivot our business to higher-growth and higher-margin direct sales, we continue to maintain our commercial business that sells through distributors. This business contributed 46% of our total revenue in fiscal year 2015 and contributes cash flow that helps fund the expansion of our direct business. Additionally, these are long-term contracts and are extremely important to maximize the gift of donated tissue that is being entrusted to the Company. 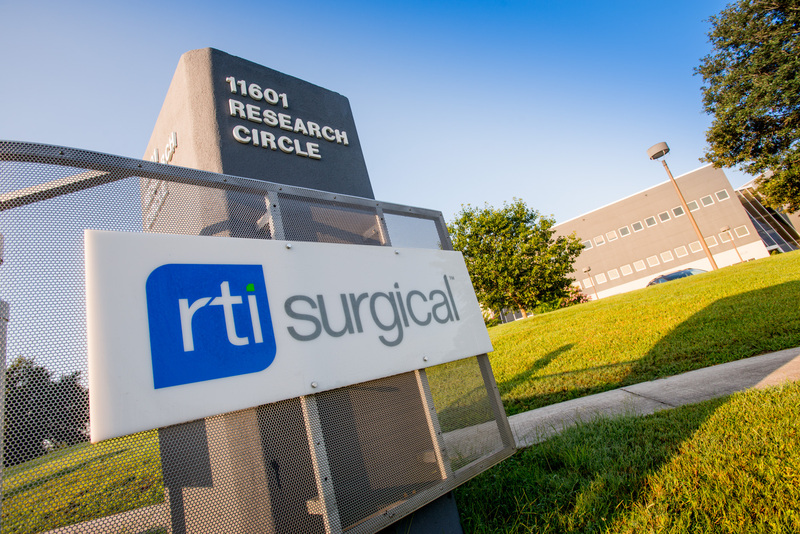 In an effort to capitalize on the growth opportunities in our market and to transform RTI into a leading global surgical implant company, we have successfully acquired and integrated Tutogen Medical in 2008 and Pioneer Surgical Technology in 2013. At the time of RTI’s IPO in 2000, the Company was primarily a tissue bank with insufficient use of tissues other than bone tissue and limited relationships with Organ Procurement Organizations (“OPO”). RTI had no direct sales force and only had relationships with two commercial distributors, contributing to low profitability and no free cash flow generation. Through mergers and acquisitions that we believe are strategic and well-executed, we have accelerated our strategy to develop direct sales, drive growth and increase margins. Merger with Tutogen Medical (2008): We believe the merger with Tutogen Medical met several strategic objectives including: creating a stronger market positon by becoming the number two tissue-based implant company; adding new tissue applications to maximize the donation; building and strengthening relationships with OPOs and tissue banks; and expanding and diversifying commercial distributor relationships. The merger contributed to stronger financial performance and following the merger, the Company achieved low to mid-single-digit operating margin and turned cash flow positive. Acquisition of Pioneer Surgical Technology (2013): We believe the acquisition of Pioneer Surgical Technology positioned RTI to capitalize on the changing healthcare landscape by: adding scale to the direct channel in the U.S. and globally; broadening and diversifying RTI’s product portfolio by adding metals and synthetics; adding nanOss® advanced bone graft substitute, one of our focused products growing at approximately 50% a year; and expanding and strengthening our commercial distribution relationships. The acquisition strengthened our financial performance with revenue growing from $178 million in 2012, the year before the acquisition, to $282 million in 2015, and operating margin improving from 7% in 2012 to 9% in 2015. Together these two transactions have, in our opinion, established the platform for RTI’s long-term growth with enhanced profitability and cash flow. They have accelerated execution of our strategy and enabled the transition to a larger direct sales model that, in our view, will underpin sustainable and lower-risk value creation for all stockholders. As the Company has entered new stages of development and transformed to address the changing industry and healthcare paradigm, our nominating and governance committee has recognized the need for change and has led the endeavor to refresh the Board in an effort to ensure we have the right leadership team to enhance long-term stockholder value. If our slate of nominees is elected at the upcoming meeting of stockholders, seven of nine directors will have served in their positions for three years or less. RTI’s slate of nominees together represent an array of experience that the Board believes will be instrumental in helping RTI capitalize on the opportunities in our market and enter our next chapter of growth. The slate provides CEO experience at an orthopedic and medical device company, public company CFO and big four accounting firm experience, public company board experience, orthopedic surgeon experience to ensure the customer voice is represented, and provider and payor experience. RTI’s independent nominating and governance committee conducted a thorough evaluation to identify director nominees with, it believes, the right skills, qualifications and experience to help grow value for all RTI stockholders. This process included an evaluation of a number of candidates, including all the director candidates proposed by the dissident stockholder Krensavage Partners, LP (“Krensavage”). The nominating and governance committee unanimously determined that RTI’s director nominees are the better leadership team to direct our next phase of growth and increase long-term stockholder value. We believe the Board and management team have made significant progress transitioning to a majority of sales through a direct model that will support sustainable value creation. The strategy is yielding stronger financial results with direct sales growing double digits and profitability improving with cumulative adjusted operating income from the period 2011 through 2015 as a percent of revenue improving significantly when compared to periods prior to 2011. The RTI slate is committed to continuing on this path towards enhanced sustainable value creation for ALL stockholders. We urge you to protect your investment and vote the WHITE proxy card FOR the election of RTI’s highly qualified nominees: Peter F. Gearen; Brian K. Hutchison; Thomas A. McEachin; Jonathon M. Singer; Paul G. Thomas; Nicholas J. Valeriani and Shirley A. Weis.